That you can. If Sarah needs any thing you can get it for her I will send some more as soon as I can. I want to get clear del��..
one would take care of it for me it makes no difference about it. There was a little fight on little edisto yesterday, we could hear the muskets firing there was 2 kiled and 17 prisoners taken on the yankeys only two littely woundned there is a �. Down hear I would be on �. I shot it with my pistol. �.. under his command ��. Soon to be Lieutenant Benson begins the first fragment with arranging for the care of his family though his father. The concern for his gun could have been more than a passing one. Captain P.D. Gilreath and others tell us all how very poorly armed the 16th was at this time. Shotguns, pistols, Brown Bess flintlocks from the revolution were all a part of the weapons that went to war with the Sixteenth South Carolina. It will not be until May or June that the Sixteenth will receive her trusty Einfields. On March 29, 1862, Major F.G. Palmer of the Holcombe Legion with Major A.C. Garlington captured 19 Union soldiers on Edisto Island. (Defense of Charleston Harbor) Colonel P.F Stevens led an armed reconnaissance to attack the companies said to be on Edisto Island. The force consisted of parts of the Einfield Battalion (Seventh Battalion, Nelson's or Rion's Battalion), dismounted cavalry from the Holcombe Legion, infantry from the Holcombe Legion, infantry from Colonel Moore's First Battalion, and a section of two guns from the Washington Artillery. The force was split the first under the command of Colonel Stevens and the second under command of Major F.G. Palmer. They achieved a part of the goal of the attack. The enemy was not driven from the island but the bridge to be destroyed was. One Union soldier was killed, one Union soldier was wounded and died later and 19 Union soldiers were captured. Confederate forces sustained five wounded. 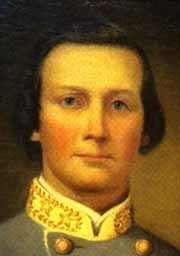 Shank Evans was the commander of the Confederate forces. The three soldiers mentioned in this letter and the writer would all become Lieutenants in Company G of the Sixteenth. Lt. Easley H. Bates will survive the war. He will return to Easley, South Carolina and found a Masonic Lodge that still bears his name.Esley Bates and Bates Lodge Lt. Elliott Batson will not be so lucky, he would be captured at Jonesboro and exchanged and captured again at Franklin. This time the fates would not be as kind. Camp Chase and pneumonia would claim him and he would be buried and recorded at Ervin Batson, this, a cousin from Company C who left his leg at Atlanta. Lt. Powell would touch many people through both his life and his children and for Lt. Benson a long life waited as well. He too would bear many children and he would be well known, well loved, and well remembered. No one can imagine the stark contrast between the mountains of South Carolina and the land around Adams Run. Game was still abundant there one hundred years later when I hunted and fished the land Lt. Benson so adequately describes and it was just as stark. He was a stranger in a strange land, the land of Gullah and Spanish moss, and a land completely unlike his land of laurel and fresh mountain springs and streams. Finally the tantalizing fragments of his observations about his new commander, who was it he speaks of? A Captain, Boling perhaps or a General Officer, perhaps no less a man than Robert E Lee himself. Lee was called to Virginia on March 3 and General Pemberton took command on March 14, making Pemberton the most likely candidate. Shanks Evans is also a possibility. Ripley is probably General Ripley, a man whose career in defense of Charleston Harbor is probably best forgotten.